Woke up this morning to this view (well, without the yellow circle). 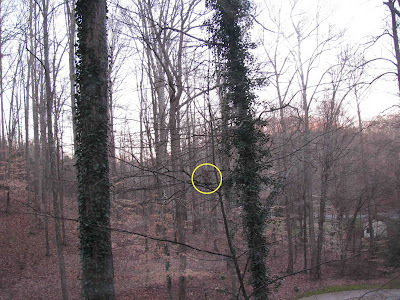 There I saw a Barred Owl just hanging out, I assume, looking for a quick bite. I hurriedly went to grab my camera and s/he was obliging and stayed where s/he was. The pair that I have been seeing was very vocal last night, and I certainly hope that they decide to nest around here again. We have had them nest in the nest box that we provided, in the past, and they were successful for a couple of years. That box needs to be replaced and I hate that it is still hanging on the tree in the despicable state that it is in. The roof has rotted and I am afraid that it will fall any day -- if that were to happen with someone nesting in there, I would be devistated. Taking care of this is on my list of things to do this week. Need to get a tree trimmer in to remove a dangerous limb and while he is here, I will have to ask him to remove the old box and replace it with a new and improved one. 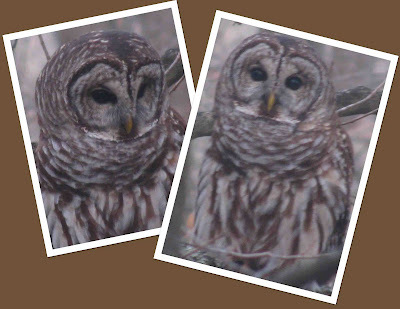 I love this site for information, including a web cam, on Barred Owls. It's a bit "old school" but has wonderful pix inside the nest box and great sound .wav files. Enjoy!